This article originally appeared in the Winter 2018 issue of Pharmacy Connection. All pills should be removed from their original packaging (original and prescription vials) and be loosely disposed of into a medications return collection container. Liquids, creams, inhalers, etc. are the only exceptions to the “no original packaging” rule. If a person returns medication in its original packaging, be sure to remove all personal identification as well as extra packaging. All pharmacies should have a “Take It Back” rack card, which outlines the proper steps of return and disposal. To ensure a member of the public is correctly preparing medications for return, please be sure to provide them with this easy to read information. If you wish to order rack cards, you can do so through HPSA’s website: www.healthsteward.ca/collection/Ontario. Please review the College’s Destruction of Narcotics, Controlled Drugs and Targeted Substances fact sheet for information on destroying controlled substances. Pharmacy staff across Ontario should not denature drugs prior to putting them in the collection container. HPSA’s programs are not licensed or authorized to handle denatured or altered controlled substances (narcotics, controlled drugs or benzodiazepines). The member of the public can combine all unwanted medications, including controlled substances, together for return to a pharmacy registered in HPSA’s Medication Returns Program (take-it back programs). Controlled substances returned to a pharmacy by the public should be placed into the collection container immediately by pharmacy staff. 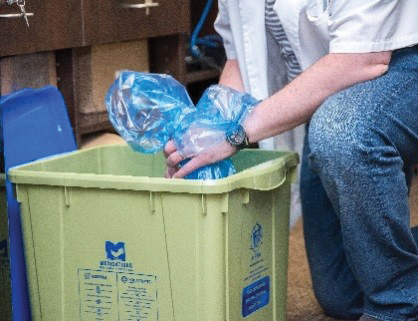 Collection containers must be kept in a secure space in the dispensary during use. Once full, the collected container should be sealed and removed from the pharmacy by the HPSA contracted waste management service provider. The pharmacist must confirm the pickup service by signing a receipt indicating the number of HPSA containers received, the number of HPSA containers picked-up and the date of service. This information must be kept on file at the pharmacy for two years.